I wrote this guide quite a while ago, but I never posted it because of it being a little "tl/dr". But I've abridged it slightly and added some new pictures. It's a bit different and mainly discusses some of my ideas about map aesthetics. Aesthetics are important to me and something I always pay attention to when I'm making maps, or looking at maps for A an S rank. I hope those of you who are interested in map-making, will find it an interesting read. There are many things to consider when making a map for versus play. One of the most important things is that the map is fair. Maps that have FTA or give one side an unfair advantage aren't generally very fun and are certainly not suitable for competitive play. Another important consideration is relative unit balance. Some maps have features that make certain units and strategies way too powerful so the game becomes dry and monotonous. Chokey maps for example can lead to indirect stalemates, base heavy maps can lead to unrelenting infantry floods. So it's important to identify these problem areas and avoid them in your map. But there are other considerations when making a map which are no less important, but are often overlooked. It is these other aspects of map making which I would like to talk about in this guide. Part 1 Aesthetics and terrain variety. Aesthetics is to do with how your map looks or the maps visual quality. The 3 most important aspects of aesthetics in my opinion are beauty, naturalness, and believability. These 3 areas overlap often as you will notice, but I'm going to discuss each one individually and its core importance. Beauty is a fairly abstract concept, and somewhat subjective, but it is not entirely subjective, in fact people often agree that certain faces or sceneries are beautiful, the same is true of colours and music. Beauty can be thought of as an arrangement of objects or colours (or sounds) which is pleasing. When it comes to maps it is often pleasing to be able to recognise shapes and forms. These might be real life objects or merely swirls and patterns and lines that are familiar and fun to look at. Arrangement of these shapes is also important, repetition can be comforting and very complimentary. But too much repetition can be monotonous, so it must be broken up with some degree of variation. The best way to describe it might be as variation on a theme. The important thing to remember regarding beauty is to give your map character, base it on a shape or a theme, which makes it interesting and instantly recognizable. You should also think about colour, adding a little blue into your maps or choosing armies in complimentary colours can have a big impact on the way a map looks. Maps are supposed to represent real world terrain, so it is nice when a map is believable as a real naturally occurring island or mountain range or forest. Real terrain can be quite haphazard. Islands and forests and mountain ranges don't naturally occur in perfectly geometrical shapes. They have coves and beaches and clearings and ridges and plateaus. Even man made features such as roads are often curved and wandering. Naturalness is somewhat at odds with the patterns and lines I described in beauty, as well as ideas like symmetry, which aside from being beautiful are also important in making a map fair. The most important thing is to find a balance, maps can be recognizable shapes while still having natural looking features and coastlines. In fact many of the most interesting real world terrain features are those that resemble something familiar (Italy looking like a boot for example). Believability has to do with how believable the map is as a disputed territory. Games require us to use our imagination all the time- in Advance Wars we like to imagine that the pixels we move about represent little tanks and helicopters, and that the 2 dimensional mountains and forests they move over represent real obstacles for them. We know it isn't real, but we withhold our disbelief in order to have fun. So imagining is nothing new to us. When it comes to maps, we like to imagine that we are fighting for a real disputed territory. So giving the map some resemblance to an area people might actually want to fight over or have a reason to contest is a good thing. It isn't necessary for a map to be this way, just like it isn't necessary for the tank sprites to look like cool little tanks, but it enriches the experience. Obviously naturalness is important here because before we can believe a piece of terrain is worth fighting for, we have to first believe it is a piece of terrain. Notable things which people fight over are islands, ports, rivers, bridges, hills, forts, cities, fuel dumps, etc. Other reasons people fight is to protect convoys and supply lines, in order to invade or retreat, as a decoy for a strike elsewhere, as a training exercise, or just the chance encounters of patrols. I'm sure you can think of many other interesting and unique reasons. It isn't necessary for a map to have this aspect, but you get extra points if you can give a tiny bit of meaning to the battle. Sometimes just giving a regular map a significant sounding name is enough. Aesthetics is only one aspect of map making, while it is important it must be used in harmony with other aspects and not dominate at the expense of fairness or playability. Each of the aesthetic aspects I have described has a popular deviant form where people have taken it too far. I believe they are worth mentioning here. 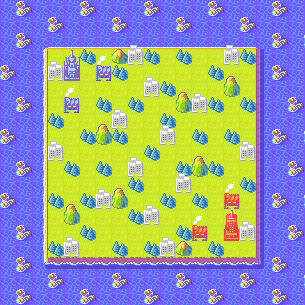 The deviant form of beauty would most certainly be the sprite map. 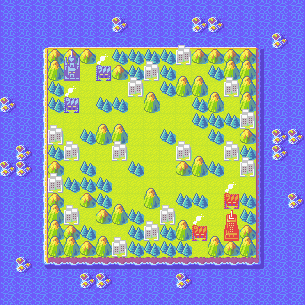 Sprite maps look great but most are unplayable, and the others are hardly ever fun or interesting to play on. Even some of the maps which just resemble objects can be bad. I know I said previously that they can be good, and this is still true, but remember not all shapes make for good games, so choose carefully. The deviant form of naturalness I would say are the world maps (maps built to accurately resemble a map of earth). These maps are almost never fair and can often end in insane Atlantic stalemates. There is a sect of map makers who believe that all symmetrical maps lack naturalness, and while I agree with this in principle, asymmetrical maps compromise too much in the way of fairness for me to ever want to suggest symmetry be avoided. The number one form of deviant believability maps has to be the 'invade Black Hole's fortress' maps. These maps nearly always have multiple allied forces all against Black Hole who has one huge force surrounded by pipes. While it is nice to imagine you are playing out the final battle of a campaign and putting an end to Black Hole once and for all, these maps are nearly always atrocious. Fighting for a single chokey bridge is another great way to do this wrong. Giving meaning to your battle is one thing, but don't do it at the expense of playability. Some people neglect aesthetics as merely something superficial, which has no bearing on games. This is true to an extent, but it overlooks the huge impact that aesthetics have on people and their perception of your map. It doesn't matter how fair your map is or how well it plays if no one ever likes it enough to give it a chance. A great way to ensure your map never gets played is to make it ugly with loads of broken shorelines and clumps of bridges. Another thing is that a map which looks good and is natural and believable to play on makes for more exciting and fun games. It enriches the experience for the players. Even on the cart you will notice that the campaign missions where you had to attack fortresses were much more immersive, despite the fact that fortresses have next to no impact on the game. They just look cool. Terrain variety is important not only from an aesthetic point of view but also in terms of playability. 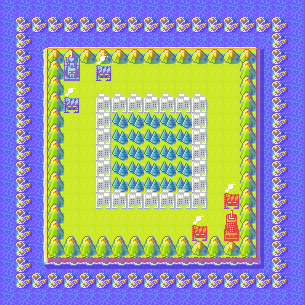 A map with only one type of terrain not only looks dull and monotonous but feels dull and monotonous to play on too. A good map has a variety of different terrain types. It is not enough just to have all different types of terrain, you must also distribute and mix the terrain throughout your map so that it is natural, interesting, and varied. Terrain clumping was a term coined early on by mappers to describe a large area on a map where all the terrain is the same. Clumps of terrain are not only ugly but can also be boring and irritating to play on. You will notice terrain clumping is a frequent criticism of maps. Below is an example of a simple map with clumped terrain. I've seen clumping much worse than this, but you get the general idea. You will notice here that every single plain, city, wood, mountain, reef, and sea tile has at least one tile of the same type adjacent to it. A game on this map would probably be quite boring. Terrain scattering is a term I just made up to describe something (a problem something) that people do (I would assume) to avoid being criticized for terrain clumping. Terrain scattering involves carefully and deliberately spreading out terrain so that no two wood, mountain, city, or reef tiles lay adjacent to each other. Below is an example of terrain scattering. You may actually find this map difficult to look at for any great length of time. This is because your eye has nothing of significance to rest on, and is instead forced to dart eternally from one point of contrast to another equally significant point of contrast trying (but failing) to make sense of the image. This is a great way to give yourself eyestrain (I haven't done it here but many people who do this also break the shorelines with reefs which is really ugly). 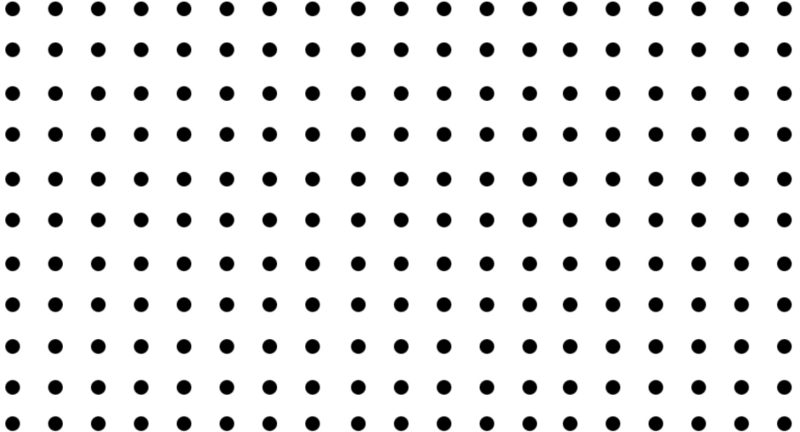 Here is another image specifically designed to give you eyestrain... you will notice the similarity is striking. The problem with terrain scattering is that even though every point on the map shows good terrain diversity, when you look at the map as a whole you see that the terrain has just been homogenized, spread evenly throughout the map so there is no real variety at all. Every point on the map looks more or less the same as every other point, and will be equally uninspiring to play on. You may also notice that this scattered look is unnatural. This is because the terrain has been scattered too evenly and deliberately to be natural or random. 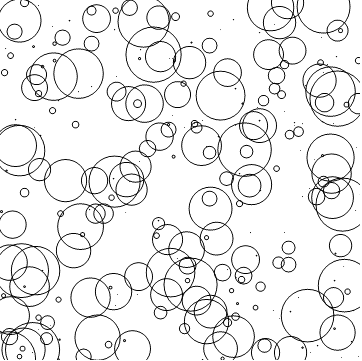 Below are some truly random circles as a comparison. What I am trying to convey here is that not only do you need variety in the different types of terrain you use, but you also need variety in the density and concentration of that terrain. So that woods, mountains, and reefs range from clumped to solitary and everywhere in between. Below is an example of the same map but with what I would call good terrain variety. Notice that this map is much easier on the eye than the scattered map, and much more interesting than the clumped map, and probably the most natural looking so far. What I have done here is arranged the terrain in varying densities. Clumped at the edges and scattered towards the center. This gives the map more shape and allows for a large range of strategies to come into play, with tanks being good in the center while the corners offer a haven for mechs and artillery. I have even carved a chokey little mountain pass to provide areas of interest in the corners. Here the chokepoints are good because they are interesting but aren't going to cause a stalemate because open areas balance them out. Obviously the clumped areas don't have to be at the edges, they could be in the middle, or north and south, or anywhere you like. You decide what shape you want your map to be, and then use the terrain to sculpt it out. There seem to be some good and bad points about smackcakes analysis. First the explanation of a natural looking map is interesting and sems good. I think in general players will prefer natural looking realistic maps. justice to the argument for natural maps. which will make progress very hard , encouraging standoff situation. we can expect great battle here over these goodies. and was found to play very well with unabating battle.. No standoff at all .. The central clump of forest was totally contested in all out war.